January is National Radon Awareness Month- Know your levels! Radon and its decay products are a colorless, tasteless, odorless, radioactive gas which has been scientifically linked to cause lung cancer. The gas is a natural byproduct of uranium deposits at varying degrees of decay located within soil beneath our homes. We breath in the gas/decay products after it naturally enters our homes. About 21,000 Americans die each year related to radon decay products. 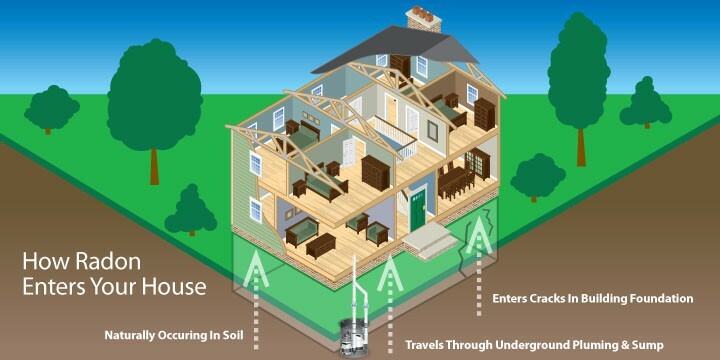 Everyone should test to know their level of radon decay products in their home. More than 50% of the homes tested in Colorado have an elevated reading at or above 4 pCi/L, the guidance level the EPA suggests you act to reduce radon levels. Here in Colorado, the average radon level is 6.1 pCi/L. Denver comes in at 5.2 pCi/L. Jefferson County is at 6.74 pCi/L. This past year I personally tested over 100 homes, most of them in Jefferson County and in the foothills area and our average test result was over 7.1.pCi/L. While radon is more common to be found in the mountains, lower elevations and any size community are just a prone to the same varying degrees of radon too. Don’t get fooled by those to say, “there isn’t any need to test because there’s no basement, or there’s a walkout basement or a crawlspace present” – that’s a long-time misconception, a wives’ Tale. Sure, levels may/could be less with those circumstances , but it’ NEVER a reason to not test!